Vine weevil feed underground on roots and stem-bases from mid/late summer through winter, severely weakening or killing plants. Mainly a problem in container plants, but can cause serious damage to some plants in borders and to strawberries. Larvae are ‘C’ shaped, cream coloured with a brown head. Control with parasitic nematodes (Heterorhabditis sp.) Heterorhabditis-System provides a rapid, biological cure for vine weevil larvae in containerized and outdoor crops. It is based on a unique strain of the insect parasitic nematode Heterorhabditis megidis, which seeks out and destroys vine weevil larvae in compost. Biology:Heterorhabditis-System is able to exert such rapid and effective control of vine weevil because of the way in which it works. 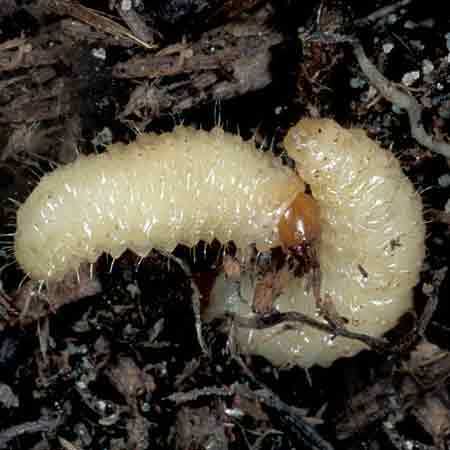 When applied to the compost, the nematodes seek out larvae already present in the root zone. They enter the larvae through natural body openings or by penetrating the cuticle directly. Once inside, they release symbiotic bacteria. A larva which is attacked will colour yellow to reddish brown and will die after about two days. 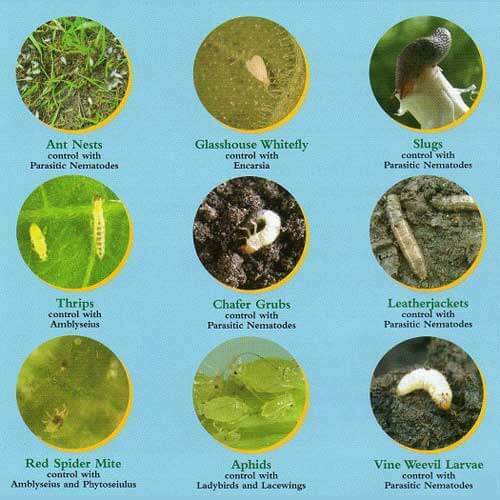 The nematodes reproduce inside the insect and as it decomposes, a new generation moves off in search of further prey. Ensure compost is moist before applying Heterorhabditis-System. Irrigate if necessary. The compost must not dry out at any time after treatment. Compost temperatures should not fall below 12°C for 14 days following treatment. At compost temperatures above 30°C activity may be reduced. Do not apply Heterorhabditis-System in bright sunshine. The Heterorhabditis-System-solution may be poured, dripped on each plant individually or sprayed globally. Heterorhabditis-System may be poured on each plant individually. Suspend one Heterorhabditis-System package of 50 million nematodes in at least 100 l of water (or at least 10 l of water for a package of 5 million nematodes). Calculate the number of pots or the surface to be treated by means of the recommended dosage. In case of pot plants (o.a. Poinsettia, Cyclamen) Heterorhabditis-System may be dripped. In order to find out the required amount of Heterorhabditis-System, first the pot soil volume must be calculated. Calculate by means of the recommended dosage the number of pots to be treated with one Heterorhabditis-System package. After application it is wise to drip some additional water as well, so that all nematodes end up in the pot. Spraying may be done with ordinary spraying equipment (maximum spraying pressure 5 bar). Use a nozzle with an opening of at least 1 mm. Immediately after spraying, the crop must be rinsed with a great amount of water in order to make sure that the nematodes end up in the soil. For outdoor crops the time of treatment especially falls in April-May and August-September. For cultures in heated greenhouses this may be at any time of the year. Heterorhabditis-System remains effective until about 4 weeks after application. The control of larvae which have hatched after this period may be insufficient. It is recommended to treat new introduced breeding material with Heterorhabditis-System, because it may contain vine weevil larvae. In case of spaying, all fine filters (with diameters <1mm) must be removed for the spraying system, so that the blocking of nematodes during application is avoided. Do not use centrifugal pumps for preparation. The effect of those pumps may be fatal to the nematodes. Open the package carefully and empty it into a bucket with 10 l water with a temperature of 15 to 20°C. Pour the suspension carefully into the tank or watering can, in order to obtain a ready-to-use Heterorhabditis-System suspension. Shake the tank regularly during the application to keep the nematodes in solution. Rinse the tank thoroughly after usage.